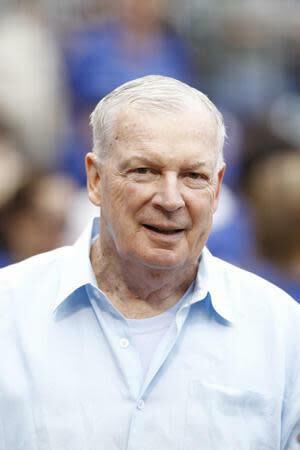 Only two months after being diagnosed with bladder cancer, longtime ESPN college basketball analyst Digger Phelps received some great news from his doctors. They found no blood in his urine during an appointment last Thursday, so they ran some tests and informed him Monday his cancer is in remission. "It was a lot of relief," Phelps, 71, told WSBT-TV on Tuesday. "A lot of prayers, a lot of people behind the scenes making things happen for my family. We were praying, and the prayers have been answered." Phelps initially revealed he was battling bladder cancer in late April soon after completing his 20th season with ESPN. The former longtime Notre Dame coach underwent a surgical procedure to remove cancerous tissue from the bladder and received a weekly BCG treatment designed to prevent the cancer from returning. In the interview with WSBT, Phelps said he intends to return to ESPN as an analyst next season. He also preached the importance of frequent checkups for men and women in order to detect treatable forms of cancer as early as possible. "I think because of early detection and getting a physical twice a year, that's what saved me," Phelps told the TV station. "As I say to men and women, there are 72,500 cases of bladder cancer the first four months of the year. To me, it's early detection. Any sign of blood in the urine, go after it. Now, after beating prostate cancer because of early detection and bladder cancer, hopefully I can lay low for a while and live a healthy life."